Utilities are increasingly challenged to make optimal infrastructure investments. Assets are not only aging, they are also changing – becoming more distributed, digital, and their lifecycles more variable. In this increasingly complex environment, it’s crucial for organizations to maximize the value delivered by their investments. Making asset investment decisions at an enterprise level, as opposed to within traditional departmental silos, ensures that the projects selected drive an organization’s strategic goals. How can utilities leverage enterprise portfolio management tools to make decisions across the enterprise that deliver the most value overall to the enterprise, drive their strategy, and create a culture of enterprise-wide accountability? 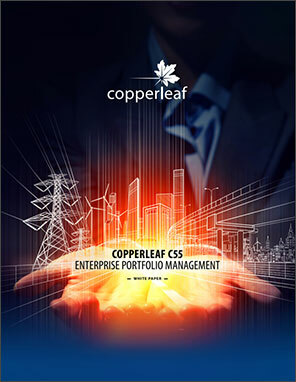 Download our white paper to learn how Copperleaf’s PPM solution can help your company today. Copperleaf C55 provides Enterprise Portfolio Management specifically suited to the needs of organizations managing large numbers of physical assets.